A year or so ago, I picked up a Michelin Pilot City tire (700x32C) to see how they compare with the twice-as-expensive Schwalbe Marathons we’ve been using on the Tour Easy recumbents. I’d blame that failure on overpressure, but I’ve been running the back tires around 70 psi, well inside their 87 psi (that’s a nice, round 6 bar) sidewall rating. This entry was posted on 2015-05-29, 07:13 and is filed under Machine Shop, Recumbent Bicycling. You can follow any responses to this entry through RSS 2.0. Both comments and pings are currently closed. No excuse for this kind of failure. If you bought it from Performance Bike they would exchange it without hassle, but ask for proof of purchase. If the defective tire was their store brand they wouldn’t even demand PoP. Yeah, but these days I’m a low-dollar eBay / Amazon junkie… because PBS / Nashbar don’t carry anything that fits our bikes. I bet it made quite a bang when it went. Disc brakes? You’re unusually conscientious — if I saw this on a slob’s bike, I’d assume badly adjusted rim brakes, that were touching slightly above the rim and had worn to the point where the brake shoe had a little rubber edge cutting through the sidewall. Wonder to behold, I caught it before the bang! Although I’m not much for washing & primping the bikes, I’m pretty good at keeping the brakes working; the pads are nice & flat. The failure looks like they didn’t quite get the carcass wrapped around the beads (or whatever they do to anchor it), as that whole section has separated fibers on both sides of the opening. I wish the bikes had disk brakes: those little bitty pads wear out entirely too fast. FWIW disc pads wear out pretty quickly, too… They are easy to replace, though. I’ve seen the same sidewall failure. No idea what’s up with it. 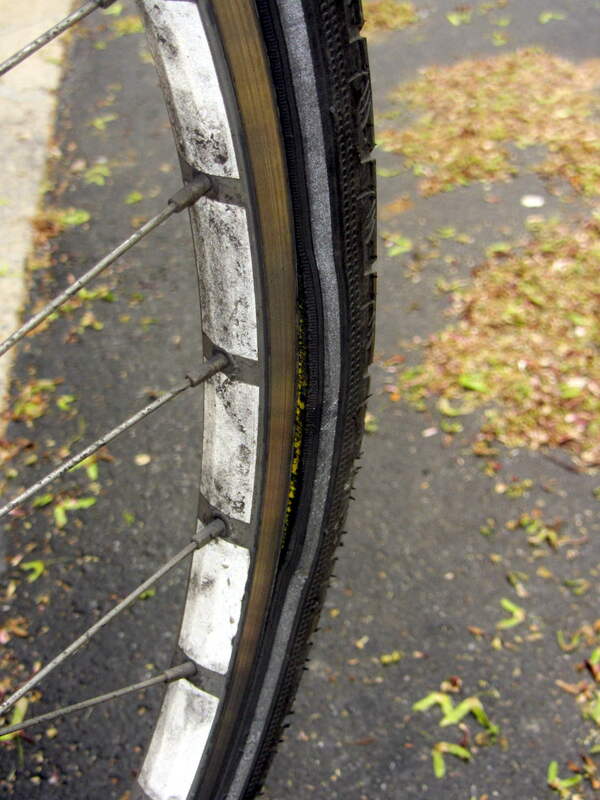 I will say this: I have ridden Continental tires that were so old and dry-rotted that I could quite literally see through the tire (sans tube) because there was nothing left of the sidewall save for the threads. All the rubber was gone. They were still managing to do what a tire should do. That leads me to think there are different ways to lay the fabric over the beads, and some companies do so in a way that gives you a lot more lifetime, albeit of dubious wisdom. I’ll write it off to a production glitch in whatever passes for the Michelin factory these days, but I don’t see a compelling reason to try ’em again. those little bitty pads wear out entirely too fast. That’s because you foolishly insist on USING the brakes. Change your ways! Repent!! fixed gear recumbent. Engine braking: if it’s good enough for Mack trucks, it’s good enough for me. That would be a sight to behold: any hill I could conquer would shred my legs on the other side!